Nothing wakes you from a deep sleep quite like the sound of your little one screaming from their room. They may be hungry, or scared, or wet or simply in need of a cuddle. Or, they may still be asleep and completely unaware that they’re screaming, thrashing, banging and howling in bed. This is what night terrors look like. And they are something quite a few kids go through at some stage in early childhood. Children do a lot of strange things: they eat dirt; they rub Sudocrem all over their bodies; they refuse to eat anything that isn’t shaped like a triangle. But one of the most puzzling childhood experiences I’ve ever witnessed as a parent is the phenomenon of night terrors in children. My son had them consistently from the age of two to around the age of five. And, while I assumed I had somehow scarred him as a baby to give him nightmares, this isn’t actually the case at all. According to the Royal Children’s Hospital Melbourne, at least 5 in every 100 children will experience night terrors. Other resources put the number of kids a lot higher (40 in every 100 children). Night terrors in children often start around the age of 18 months or two years and most kids grow out of them by six. Here are a few things about night terrors that I wish I had known back when my son got them. 1.Night terrors look similar to a panic attack or temper tantrum, but while in a deep sleep. Scary, yes. Even scarier when you’re witnessing your toddler experience it. You can expect heavy breathing, sweating, screaming, crying. His little body may thrash around in the bed. His eyes may be open and glassed over. He may seem awake. He may even stand up and walk around. But your child isn’t awake. He’s in this weird dream-like state. And he has no idea what is happening. Five to 15 minutes, on average. And they normally only occur once a night. I found my son would get them between the hours of 8.30 and 11.30pm. Then, after it was over, he would fall back asleep and I would stand at the doorway for the next five hours, wondering what the hell just happened. Some nights he wouldn’t get them at all. He would go weeks without having night terrors and then they would start up again. Sure, it is easy to assume that your child is experiencing serious trauma after witnessing night terrors. But this isn’t the case at all. Night terrors happen in normal children and are not usually associated with serious emotional or psychological problems. Sometimes night terrors occur simply because your child hasn’t learned how to fall into a deep sleep just yet. Other times it’s because your child is under the weather or isn’t getting enough sleep. You may want to try adjusting his bedtime or enforcing nap time to see if that helps. Night terrors in children also run in the family. So ask your parents if you had them as a kid. Although it takes every ounce of strength to NOT want to wake your child, cuddle him, comfort him and reassure him that it was all a dream, it’s not a good idea. It can leave your little one confused and disorientated. After all, he isn’t even aware he’s in the middle of a night terror. And he won’t remember it in the morning. Stay close. Make sure he doesn’t hurt himself. Guide him away from obstacles. And wait it out. During a night terror, your child is not awake. During a nightmare, your child will wake up. Children generally won’t remember night terrors but they can remember nightmares. 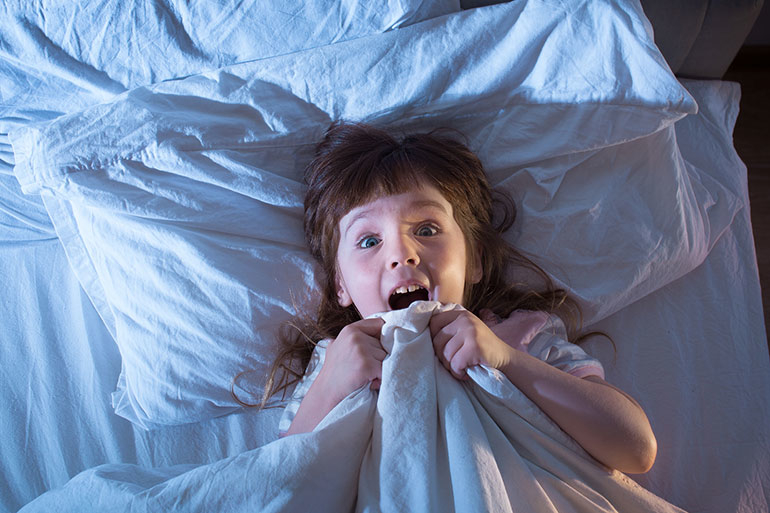 Night terrors won’t frighten your child (although they can be pretty terrifying to watch). Nightmares can frighten your child. And they will probably need a cuddle afterwards. Night terrors usually occur during the first few hours of sleep. Nightmares tend to happen in the second half of sleep (during the REM phase). If your little one is experiencing strange sleep thrashing, screaming and bashing, know that you’re not alone. If your child is also having trouble sleeping or has difficulty breathing at night (sleep apnea), you may want to have it checked out with a GP. But just remember, as scary as night terrors in children are to witness, your child is perfectly fine. They’re going to be okay. They will grow out of it. And you will, one day, get a full night’s sleep again. One day. For more useful tips when it comes to children and sleep, take a look at our previous article about sleep routines for kids of all ages.